Jesus, Savior of all people, save them! "This Cross will chase away the devil. It will spread warmth and life. 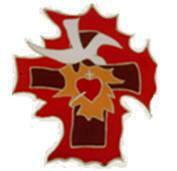 It will cure souls and bodies and do many miracles"
The Holy Spirit, personal love of God, is symbolized by the dove that appears above the Cross of the Apostolate. This represents that salvation is an act of love and that the Holy Spirit moves Christ and moves us to surrender to the Father by way of the Cross. It is the symbol of our human condition that Christ wished to make His in order to free us from misery, pain and death, the consequences of sin. It also signifies that our daily cross, united to Christ's, participates in its redemptive value and allows us to reach intimacy with Him. 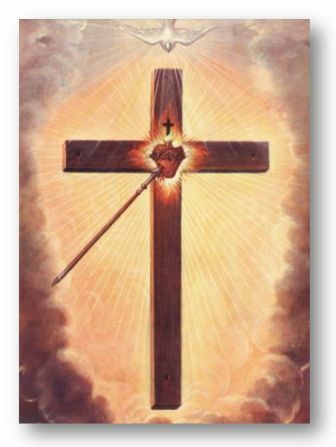 The Heart at the center of the cross, surrounded by flames, wounded by the lance, crowned with thorns and shedding blood and water from the wound, symbolizes the love of Christ for his Father and us. A love that moves Him to claim our cross as His own and that reached its climax in the painful offering of Himself unto death. It expresses the personal and most intimate pain of Jesus: his sorrow as Son at not seeing His Father's love reciprocated, his sorrow at the suffering of man that, due to sin, does not live in love, his sorrow for the unfaithfulness of those most intimately associated with His work of salvation. The light and clouds symbolize the loving presence of the Father, whose glory is manifested in the salvation of mankind. One morning, after having received communion, Conchita was recollected in God; all of a sudden, she felt a strong joy. She had a vision, something like an allegory, something that she did not understand. Of a natural size, and on the right side of the transept of the Church called "The Society", in San Luis Potosi, a square of very bright light, that became clearer towards the center, so clear that it appeared to be white light. In the middle and above this abyss of light, with a thousand golden rays, apparently of fire; a very white dove, as if coming from heaven, with the wings spread covering the flood, that sea of so bright a light. Conchita again did not understand all of that, that she was seeing. As the Works of God: with gentleness, calmly, a horizon of dawn, of a lofty and dark vision that without knowing was known: as it was light and it was love, what was burning there. Two or three days afterwards, in February 1894, on an afternoon, at the same church: the dove returns again, and as always, amidst suns and the spread wings. But, this time, in a background of that so brilliant a light, radiantly appeared: the wood of the Cross! A big Cross, very big. With a Heart in the middle, where the limbs begin. This Cross floated, was among light suspended, in a twilight of clouds; as in a frame that was with fire enlighted. And,...under the Cross, a thousand rays that were never mistaken, neither with the white dove nor with that brightness that the clouds emitted. The Heart was: alive, throbbing and of flesh. Very human, awash in fire. Movable, touchable and material. As a special blaze of an unquenchable fire: something that made visible that it was GLORIFIED. From the heart spranged up, from its interior: flames, flames as tongues of fire of a very fine brightness. These went up with violence, as the rage of a volcano. They covered and uncovered, a small and black Cross, inserted in the Heart, although somewhat standing out. The throbbing Heart moved with anxiety, in a disk that as a sun more light gave to it. Although it was Glorified, hard thorns were hurting it: they squeeze him, that it hurts to see, "thorns of ingratitude that were never consumed." A lance pierced him so, that a wide wound it caused. There blood springs forth, liquid and set, dripping, making threads on the Cross. Two months went by, thus. That Cross appeared, in prayer as well as in the daily chores. An obsessive Cross that neither at night disappeared. But suddenly: the Lord speaks! And thus Conchita understood, that on her shoulders, a Cross He would put. "My heart will be like your cloister--He said--there you will soak in the love in which I love. Look, there is rest there. Perfection on earth, as mine. The intensity of love, purified by yearning and by sorrow: as my love without a cross wouldn't have been love. Love! Sorrow! Oh, Concha, my Cross of the Apostolate!" And so she knew which her vocation was: "I have a Heart fixed on me,--she would say--speared and pierced... I long for many souls in that Cloister: I thirst for souls, I thirst for consolation for this the Heart of my Beloved". Conchita would always say: "Let us climb to the Cross, with courageous love". "The poor Cross left our world and came from on high, it came full; loaded with treasures: with all those of a Risen God!". "It will drive away devil; it will spread virtue; it will heal bodies and souls; it will make many miracles!" It will grow in LIVING CROSSES; in all those that united to the Lord: with cheerfulness on the lips, joy in the heart, but nailed to the Cross, tell Him with their life: Jesus, savior of all people, save them!